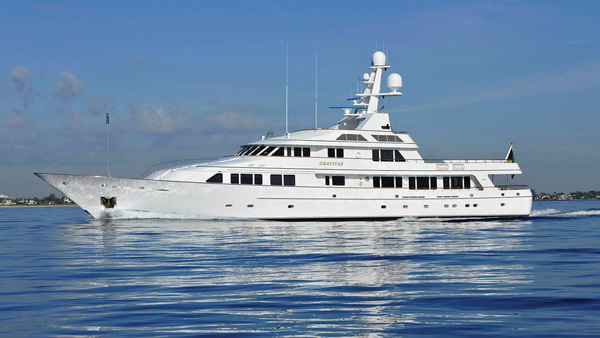 Built by Dutch yard Feadship and delivered in 1995, Gravitas offers a unique and versatile layout. Privately she could accommodate as many as 18 guests, while under charter a maximum of 12 guests is permitted. The vast main saloon offers guests a superb area to socialise, relax or entertain with two full sofa seating areas – one to starboard and one aft to port along with a games table. The guest accommodation stairs are located aft within the main saloon surrounded by a beautifully sculpted railing which becomes a piece of modern art subtly featured in the room. The separate formal dining room lies forward and can be enclosed for privacy. The table seats 10 or can be extended for 14 just as comfortably. A spectacular master suite on the main deck comprises three connected rooms and includes an intimate and elegant breakfast bar which in the evening turns into a private cocktail bar. A further six spacious staterooms below come with ample storage, fully equipped entertainment systems and en suite facilities. A favoured location on board is the sky lounge which can be used as a cozy place for a movie night, privately curling up with a book or hosting cocktail hour at the 360 degree indoor/outdoor bar. The spacious guest office is just forward to port of the sky lounge and features two desks with leather swivel chairs and computer. Water toys include a tender, two Waverunners, water skis, snorkelling gear, diving equipment, fishing tackle and a wide selection of towables. Gravitas charters through Northrop & Johnson.